Hinche Haiti - The Roads of Bois Verna Looking Very Good! 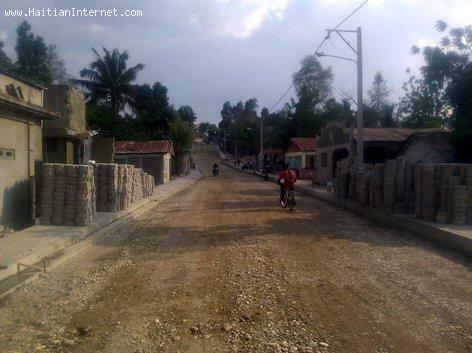 Look at this... New Road construction in the Bois Verna section of Hinche Haiti. Bois Verna was once considered one of the worst parts of town, Hinche residents used to call it "nan bwa pitimi an" but not anymore!!! Nowadays, The road are large, straight, with sidewalks on both sides. While taking the photo I overheard a man say "This one of the best roads in Hinche"
Bois Verna wi... Sak ta di sa! « New Plans to Build a Town in Haiti, you're the Town Planner, what do you do?